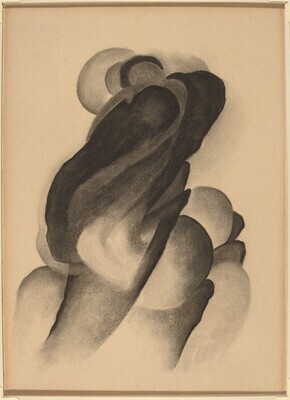 Georgia O'Keeffe: American and Modern, The Hayward Gallery, London, Palacio de Bellas Artes, Mexico City, and Yokahama Museum of Art, Japan, 1993-94, no. 7. Georgia O'Keeffe and Abstraction, Georgia O'Keeffe Museum, Santa Fe, 2009 - 2010, no. 10. Georgia O'Keeffe and Abstraction, Whitney Museum of American Art, New York, 17 Sep 2009-17 Jan 2010; The Phillips Collection, Washington, D.C., 6 Feb-9 May 2010; Georgia O'Keeffe Museum, Santa Fe, NM, 28 May-12 Sep 2010, no. 10. Cowart, Jack, Juan Hamilton, and Sarah Greenough. Georgia O'Keeffe: Art and Letters. Exh. cat. National Gallery of Art, Washington, DC; Art Institute of Chicago; Dallas Museum of Art; Metropolitan Museum of Art, New York, 1987-1989. Washington, DC, 1987: no. 28. Lynes, Barbara Buhler. Georgia O'Keeffe: Catalogue Raisonné. 2 vols. New Haven and London: 1999, no. 251. Haskell, Barbara, ed. Georgia O'Keeffe and Abstraction. Exh. cat. Whitney Museum of American Art, New York; The Phillips Collection, Washington, DC; Georgia O'Keeffe Museum, Santa Fe, 2009-2010, New Haven, 2009, no. 10. World War I and American Art. Exh. cat. Pennsylvania Academy of the Fine Arts, Philadelphia, 2016-2017: 64, repro.